Esther knows everything that’s going on around here. She is sassy and sweet and can keep up with the boys! She does so much for everyone here including cooking a lot of delicious food. Her other jobs include dishes, cleaning, and mopping. She moved here on January 22nd 2013 from Port au Prince. Her father passed away when she was 10 years old. She has four brothers and one sister. Two of her brothers moved to Canada. Her mother sells things in the market in Port au Prince. She has gotten to go visit her mother twice in Port au Prince since living here and she loves that! She really likes school a lot and her favorite subject is Mathematics. She wants to study Diplomacy when she is done with high school. Her dream is to work as an Ambassador in the United States. 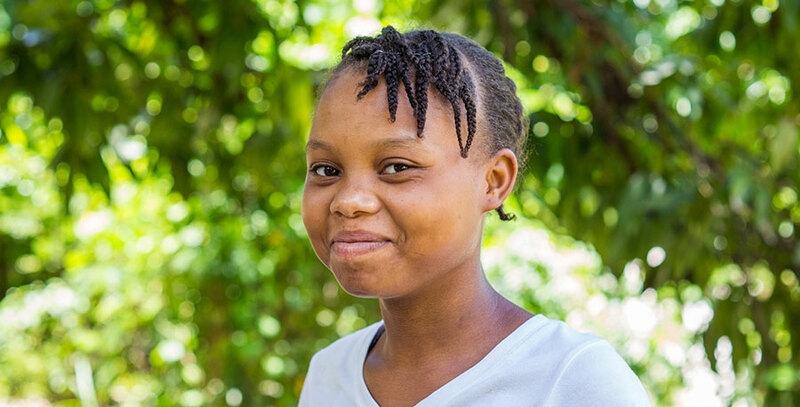 We believe in Esther and think she has everything it takes to help change Haiti! You can often find Esther reading her bible, her favorite verse is Galatians 5:22 about the fruit of the spirit. She also loves to sing and has a beautiful voice.